About 60 km from Chennai i.e. 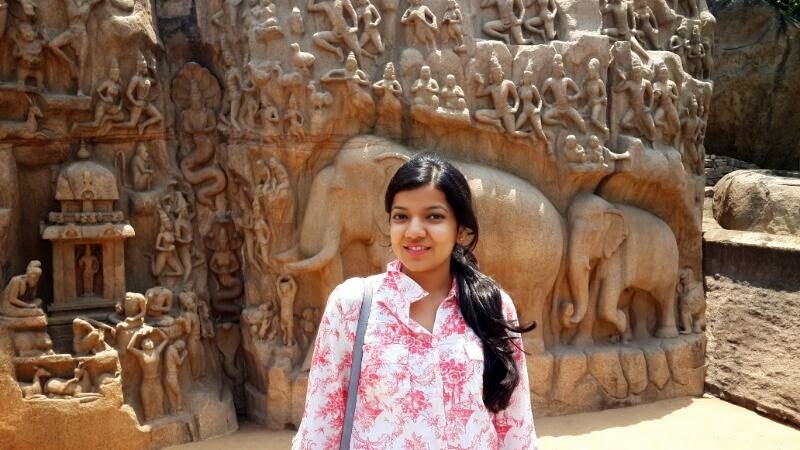 about a 1 and 1/2 hour drive away, in the Kancheepuram district of Tamil Nadu lies the ancient historic town of Mahabalipuram. 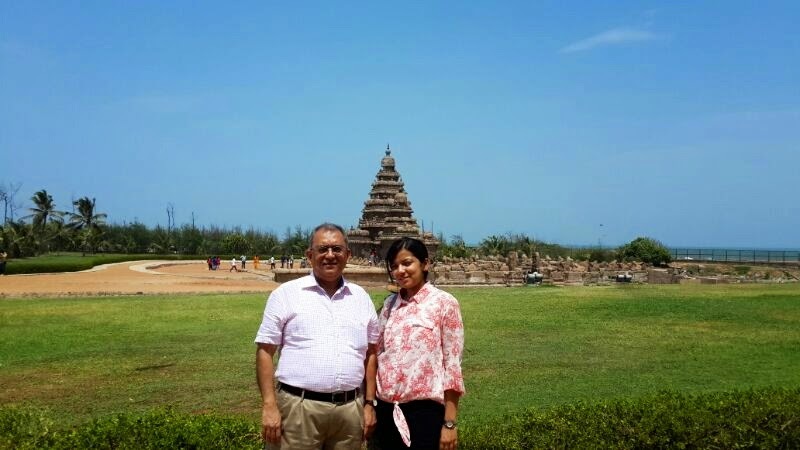 The route from Chennai to Mahabalipuram is truly titillating with mesmerizing views of the Marina Beach, the swaying coconut trees, the lush greenery of South India and a glib roadway with negligible traffic. As we drove into this city, we could see many shops both on our left and right selling rock effigies and figurines which were displayed all along the street. Soon our car halted at the site which is recognized by the UNESCO as one of the World Heritage sites. As we stepped out, we could feel the searing heat of the sun. Nonetheless, we were all charged up to reconnoiter this 1400 years old group of sanctuaries, carved out of rocks. 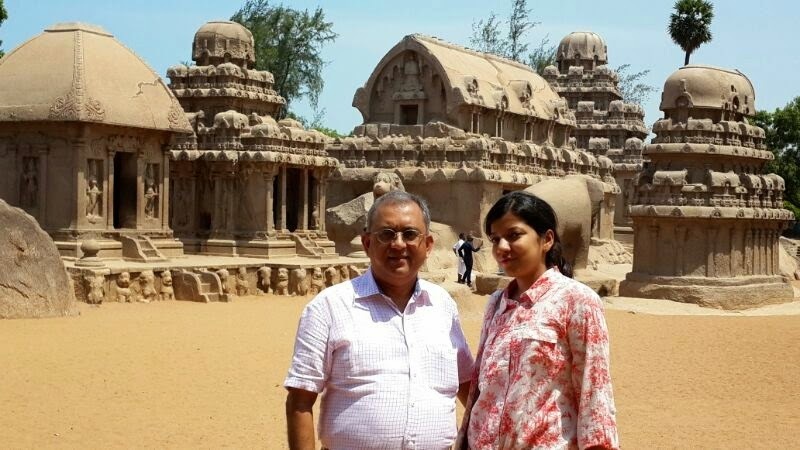 This sanctuary was left incomplete by the rulers of the Pallava Dynasty who commenced building it but whose empire was overthrown before its completion. It is a breathtaking site even in it's incomplete state, just imagine what it would have been if it was completed to perfection! The various mythological concepts depicted by means of chiseling a single rock and giving it the desired shape. There were structures like 'the 5 chariots' which were a mixture of the Dravidian, Buddhist and Roman style of architecture. There was a mural depicting Lord Krishna carrying a mountain on only one of his little finger and protecting the villagers who took shelter underneath from the deluge brought about by Indra. There was a simple wall art which looked like a cow and a calf from the right and the same old thing looked like an elephant and its baby from the left! Also, there is the very popular mural called 'The Descent of the Ganges' wherein the Ganga is depicted with various forms of humans and animals around her. Also, there are three monkeys with missing heads, these heads lie in the British museum now. Well, this isn't very surprising as almost more than half the things showcased in the British Museum are Britian's booty from India. 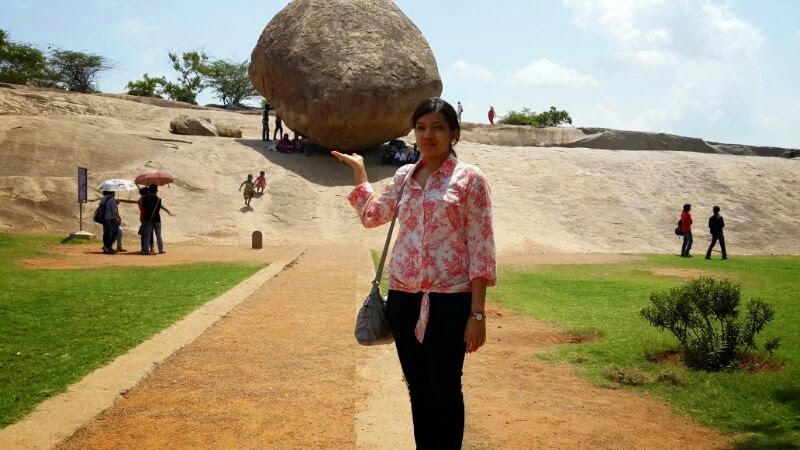 There was also 'the Krishna's Butter Ball' which is a boulder that has balanced itself on the slope of a hillock. More than a million people have put their muscular strength at test here but haven't succeeded in displacing the boulder by even an inch. Even the December 2004 earthquake could not knock this Butter Ball out of it's place. We then headed towards the Sea Shore Temple that enclosed a 'Shivalinga.' We walked through a lawn before we reached the fenced sea shore and the temple. The Bay of Bengal looked serene and turquoise, much cleaner than our very own Arabian Sea. We were taken aback hear that this place had been severely hit by the Tsunami in December 2004. The nearby villages were flooded with sea water and there was mass destruction of life and property. The Sea Shore Temple was submerged in water. Yet, when the water receded, the temple was there as always, robust as ever! This is what you call a true MIRACLE!